Thanks to my husband and nephew, both of my girls are huge Batman fans. They love all the animated movies that feature Batman, and have a nice collection of DVDs going. So, when they saw me take the Batman Unlimited: Animals Instincts DVD out of the package, they were quick to hover around me to see what it was about. In addition to seeing Batman on the cover, they also were quick to see the Firebat figurine, which was included as part of the Blu-ray/DVD/Digital HD set we were set. If only they had included, as the girls still have trouble sharing, and both wanted to hold the Firebat figurine while they watched this new movie with their Daddy that night. "Find out if Batman and his team of fellow heroes can tame the beasts in Batman Unlimited: Animal Instincts. Produced by Warner Bros. Animation, the latest animated DC Comics film to hit shelves from Warner Bros. Home Entertainment arrives May 12, 2015 on Blu-rayTM Combo Pack, DVD and Digital HD. The Blu-Ray Combo Pack and DVD will include an exclusive Firebat figurine, while supplies last. 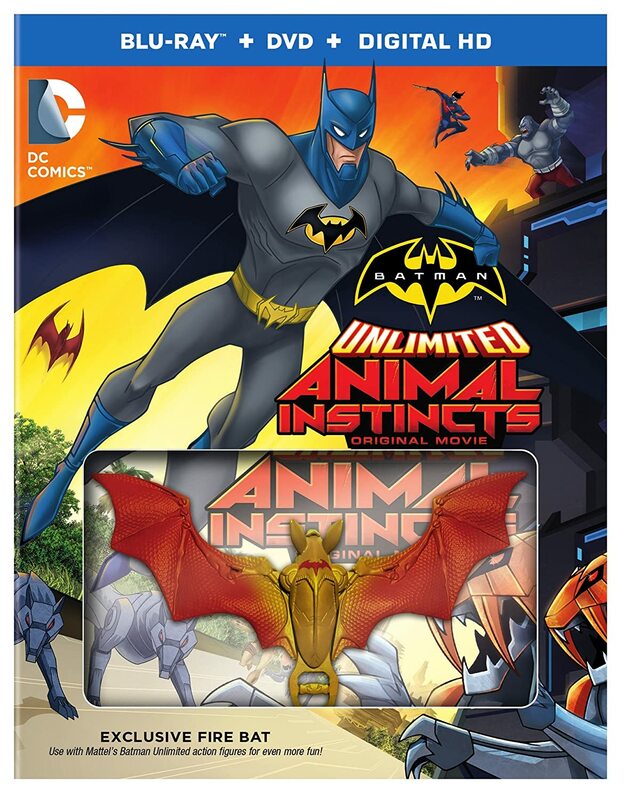 Batman Unlimited: Animal Instincts will be available on Blu-rayTM Combo Pack for $24.98 SRP and on DVD for $19.98 SRP. The Blu-rayTM Combo Pack includes a digital version of the movie on Digital HD with UltraViolet. * Fans can also own Batman Unlimited: Animal Instincts in Digital HD on May 12 via purchase from digital retailers. Batman Unlimited: Animal Instincts will be available for streaming and download to watch anywhere in high definition and standard definition on their favorite devices from select digital retailers including Amazon, CinemaNow, Flixster, iTunes, PlayStation, Target Ticket, Vudu, Xbox and others. Starting May 12, Batman Unlimited: Animal Instincts will also be available digitally on Video On Demand services from cable and satellite providers, and on select gaming consoles. Warner Bros. Animation (WBA) is one of the leading producers of animation in the entertainment industry, producing and developing both CG and traditionally animated projects for multiple platforms, both domestically and internationally. For TV, WBA produces series such as Teen Titans Go!, The Tom and Jerry Show and the upcoming Be Cool Scooby-Doo!and Wabbit – A Looney Tunes Production for Cartoon Network as well as Mike Tyson Mysteries for Cartoon Network’s Adult Swim. As the home of the iconic animated characters from the DC Comics, Hanna-Barbera, MGM and Looney Tunes libraries, WBA also produces highly successful animated films — including the DC Universe Animated Original Movies — for DVD. One of the most-honored animation studios in history, WBA has won six Academy Awards®, 35 Emmy® Awards, the George Foster Peabody Award, an Environmental Media Award, a Parents’ Choice Award, the HUMANITAS Prize, two Prism Awards and 20 Annie Awards (honoring excellence in animation). This looks great and we love Bateman in our house so this would be a big hit.